There is no better place to find local, sustainable food than a farmers market. Loaded with the freshest fruits, veggies, diary and meats and you can get your hands on, more and more people- not just chefs, but home cooks too- are developing an appreciation for these lovely European style markets. And with fall in the air, you’d better hurry up and take advantage of the seasonal vegetables and outdoor markets while you still can. For the past couple of months, I have decided to make it a Sunday ritual to swing by my neighborhood farmers market. Just so you know, I am the farthest thing from a chef, however, this new habit of mine has started to inspire me to eat healthier and… yes wait for it… even COOK for myself! While you certainly won’t be seeing me on an episode of “Chopped” any time soon, improvements have been made! My best pal Courtney who lives right across the hall is quite crafty in the kitchen, and usually joins me on my Sunday market runs- she affectionately calls these outings “marketing” trips. “We’re marketing!” she says, and she helps me adopt better techniques of carrying my basket and picking the ripest of fruits- you know, something only a seasoned “marketer” would know to do. Anyways, last night I teamed up with her to make a delicious zucchini, heirloom tomato, and ricotta pasta with a side kale salad for dinner. We picked up ALL of the ingredients from Larchmont Farmers Market and I’m not sure if it was the delicious produce, or Courtney’s masterful skills masking mine, but I’m beginning to feel like I can pull off a meal or two these days- and a pretty tasty one at that! 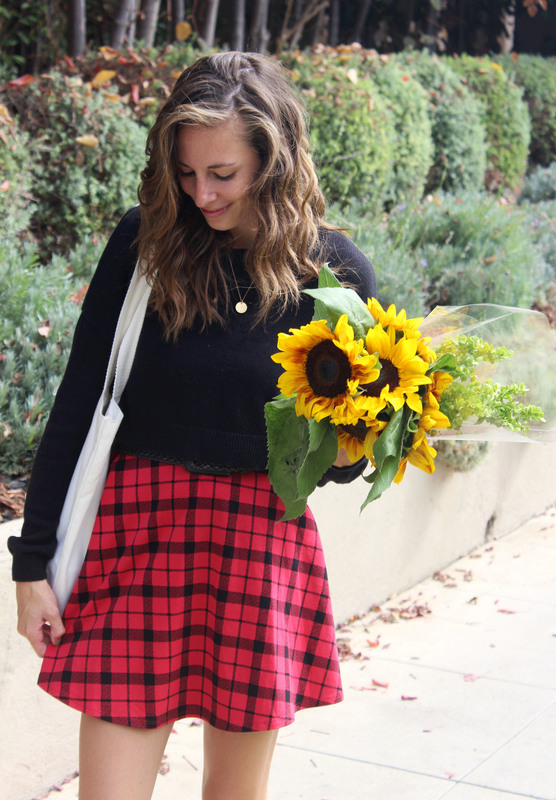 Welcoming a bit of cooler fall weather, I sported this red plaid fit and flair dress and classic cropped sweater, both from Forever 21. Effortlessly charming, this lightweight, fitted dress is both flattering and comfortable for a stroll around the market. The vibrant red plaid makes a statement of its own, which is why I kept it simple on this lazy Sunday morning with my black Forever 21 Oxfords and everyday gold initial necklace. I hope this inspires you to take advantage of the local markets in your neighborhood. If you feel like you are in a rut, always picking up the same items at the grocery store, eating because its obligatory, then I suggest you get out there and take advantage of the local farmers markets in your neighborhood. Not only will you find inspiration for new dishes in every corner, but the quality, and price of the products are simply unbeatable! Plaid Dress: Forever 21 (SOLD OUT) Suggestions Below! For all the latest fall pieces I am currently coveting, be sure to check out my shop page!